I found the DV+ ATMO/VTA Focus ST/Volvo/Porsche 911 Diverter Upgrade GFB on ShowoffImports.nl and thought you might like it. Go Fast Bits started back in 1997 designing, testing and developing GO FAST BITS. Today a wide range of innovative and high-quality blow-off valves, boost controllers, pulley kits and short shifters are available. All meticulously designed and manufactured from the highest grade materials. GO FAST BITS products are manufactured in Australia and GFB is constantly developing new and innovative products! 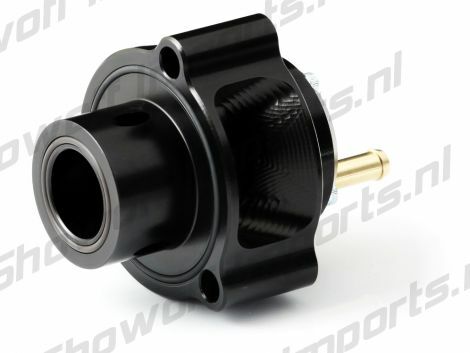 Showoff Imports is the official distributor for GFB parts for the Netherlands and Belgium. Currently we stock all popular products, so no waiting times! Dealers inquiries welcomed. What makes GFB blowoff valves different and better? MORE POWER - BETTER RESPONSE - BETTER DRIVE ABILITY - GET THE SOUND OR NOT. The first question is easy to answer: There isn't actually a 'best' in terms of quality. 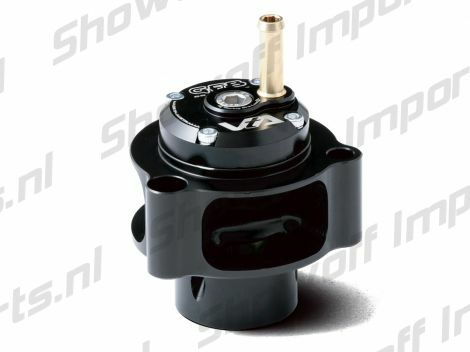 All GFB blow-off valves use the same high-quality internal components. 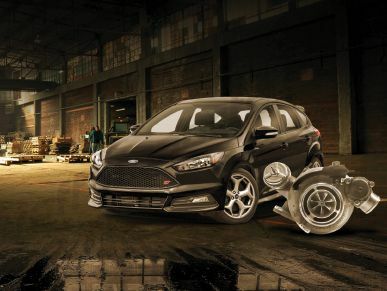 So, provided the right BOV is fitted for your particular vehicle, they all offer the same performance benefits of improved throttle response and reduced lag. The real question is: How do you select the valve for you? The first step to decide on 'your' BOV, is whether or not you want to hear it, and if so, how much? The following chart lists the “noise ratings” of our blow-off valve range. The final decision will then be based on how much control you want over the blow-off volume level. GFB boost controllers use a more consistent needle-valve bleed system, which brings boost on just as fast as any ball-and-spring system, and generally more quickly than a factory boost control system. On the productpages you can find a comparison of the GFB controller to other major brands, guess who wins this standoff? GFB! A GFB boost controller will give you the added benefit of not only being able to adjust the peak boost level, but in most cases will bring the boost on earlier, resulting in more power throughout the rev range. The reduction in rotating inertia (we've removed about 2kg by using 6061 T6 aluminum billet) means that the engine can accelerate much quicker during the times it is making very little power before the turbo spools up. The result is better drive ability off-boost and better acceleration, which is especially useful for those with large turbos that only make power in the upper rev range. The smaller size of the crank pulley under-drives the power robbing accessories so that the upper end of the rev range is less burdened, while still allowing them to operate properly. The GFB Short Shifter is the same height as the factory shifter, it is the actual distance that the gear stick moves between gears that reduced. Very simple to install. All of the installation is done from inside the car, without having to jack it up and crawl around underneath. Only a few basic hand tools are required, and the necessary hex keys are supplied. The maximum throw reduction varies for different models. Early WRXs had a particularly long throw, so the maximum reduction with the GFB kit is around 50%, whilst on later models it is closer to 40%. In either case, it is possible to reduce the distance per gate to about 30mm. Whilst it can go shorter, the shifting force becomes too great for comfort, and some of the shift feel is lost.